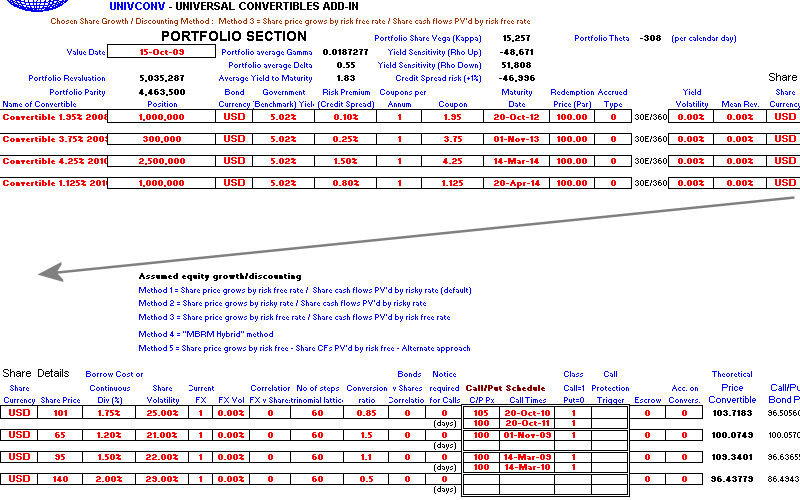 The Universal Convertibles Add-in handles portfolios of Convertible Bonds with structured calls, puts and conversion schedules, non-stationery share/bond correlation, time dependent credit spreads, discrete and continuous dividends, cross-currency and multiple conversion ratio resets. The add-in can be linked with most real-time feeds to provide a dynamic analytical environment which continuously marks to market multi-currency portfolios, and thereby improves P&L and Risk monitoring. 5 different models for assumed equity growth and discounting. 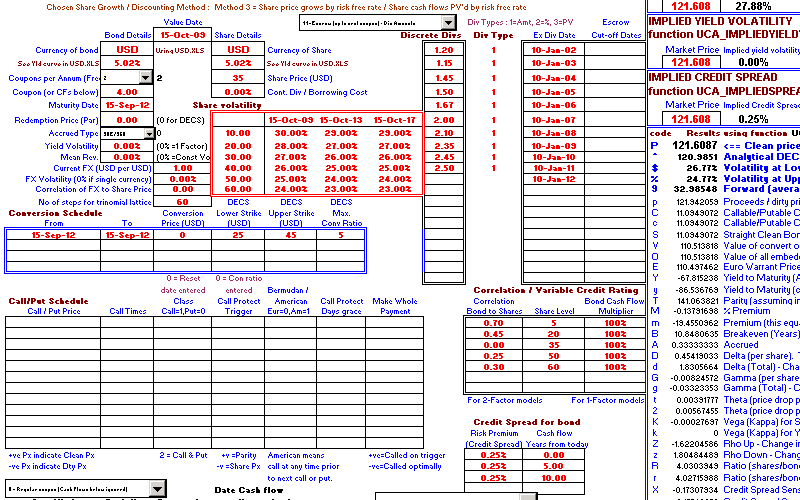 DECS (Dividend Enhanced Common Stock / Debt Exchangeable for Common Stock) are handled using a TREE instead of the usually slower and less accurate Monte Carlo Simulation. Simple Resetables and complex Multiple "CHAIN" resetables are handled using a TREE instead of the usually slower and less accurate Monte Carlo Simulation. Chain resetables are where there are multiple resets where the maximum or minimum reset price is a function of the previous reset which is currently unknown. Bonds can be defined in terms of explicit cash flows, thereby enabling the analysis of irregular coupon bonds (including step ups, step downs and rollercoasters). 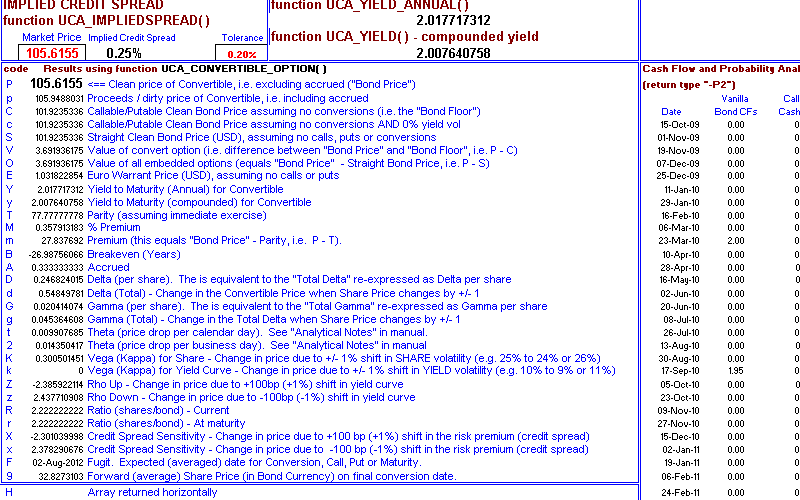 Ability to calculate the implied credit spread and the implied yield volatility from a convertible bond price. 1-factor Equity trinomial lattice tree - with variable volatility term structure. 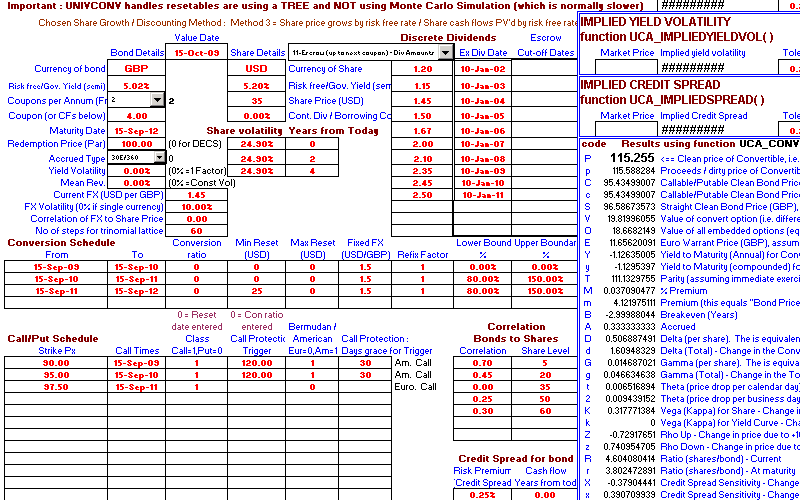 1-factor Interest rate trinomial No-Arbitrage lattice tree - with variable volatility and mean reversion term structure. This very efficiently and easily analyses callable and/or putable bonds, bond options and Bermudan swaptions (constant, amortizing or roller-coaster nominals) using the Black-Derman-Toy (BDT) and/or extended Vasicek (Hull-White) interest rate models. 2-factor (9 node) model. Combines the Equity and Interest rates into a 2-factor tree. Dr Mamdouh Barakat, Managing Director, says "We believe that our convertibles add-in sets a new standard for accuracy, speed AND price which other systems will find hard to beat. The accurate analysis of Convertible Bonds is a very complex area. 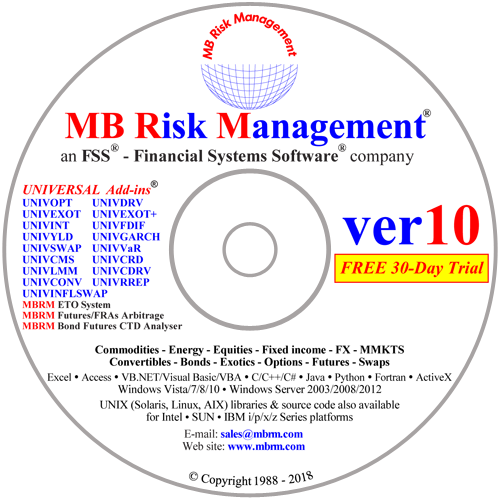 This is one of the reasons why there are very few software packages available for analysing Convertible Bonds. In our convertibles add-in, we have combined the latest techniques and models from both the fixed income and equity derivative world. We are also constantly enhancing it for the new structures (e.g. make whole payments, reverse convertibles, conversion trigger levels etc)." For increased accuracy in the construction of the interest rate term structure curve and for calculation of sensitivities caused by non-parallel yield curve shifts, the Universal Convertibles Add-in requires the UNIVSWAP - Universal Swap Add-in.